Get immediate, targeted readership for your blog. Use Q&A sites and niche forums. Q&A sites and niche forums are some of the best ways to reach your tribe, and engage with your specific community. They can increase your link-building and SEO, develop your business brand, and gain you tons of enthusiastic blog traffic. Here’s all you need to know to drive your corner of the internet to your blog - in droves. Do you use Quora, Yahoo Answers, StackExchange or askville to get blog visitors? How can you use Twitter to find niche forums? Q&A sites are an effective way to connect with your market, build your business brand, get more visitors to your blog, and improve your SEO. Find and develop new customers : Q&A sites are oriented to solving people’s problems. Your business blog articles are too, right? Engage on the sites to find and engage with your niche market. Build relationships by providing helpful, informed answer their questions. You’ll get more people clicking through to your site, and gain customer leads. Link building: Use the sites to increase your link building and SEO - but always be authentic, helpful and engaging of your potential customers on the sites. Use Q&A sites with high Alexa rankings. Link to your blog (or website) in your profile and answers. Improve your SEO: Most Q&A sites show up in Google (and other) search results. Ask and answer questions relevant to your keywords. Include links back to your site in your answers. The better your answer, the more it will be voted up by your Q&A community - which improves your SEO within the sites too. Crowdsource your market: People on these sites are telling you their problems. Use them to crowdsource your consumer research. Improve your business offerings. Use them to get ideas for future blog posts, too. The better you can solve people’s problems, the more hits your site will get. Drive traffic directly to your blog: Include a link to your blog site in your Q&A profiles. Write informative answers, with teasers of more in depth solutions found on your blog posts. Link those specific blog posts into your answers. 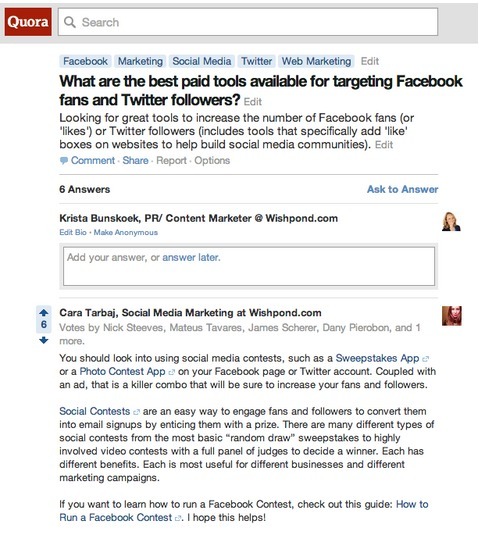 Quora - Quora is one of the largest and most comprehensive Q&A sites. It was launched in 2010 by two former Facebook employees. It has developed as a reputable source of answers, with millions of users worldwide (including some of the world’s leading experts) in a wide range of subjects. 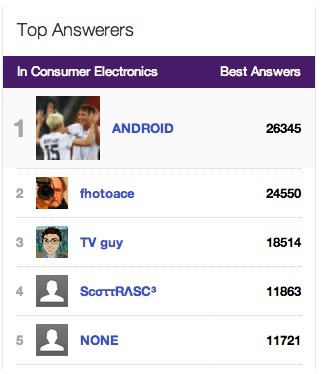 Yahoo Answers - Yahoo Answers is very popular, with millions of users engaging on the site. As a member, you get to receive points for answering questions. The better your answers, the more points you get. The more points you get, the more privileges and higher profile you can get on the site. StackExchange - Stack Exchange professes to have over 64 million unique monthly viewers. It attracts a whole range of experts and others, and has 109 categories of subsites. Topics range from mathematics to startups to bicycles and travel. It is pretty tech-centric - if that’s your market, engage with your knowledge. Askville - Askville by Amazon is a very general Q&A site. It has categories from gift ideas to science. Its members can get quite passionate about answers and can be a great source for retailers to drive traffic to blogs (and product pages). Explore a number of Q&A sites to get to know what they’re about. Assess and choose one or two sites to start to connect with your market. To get results, and have real engagement, you’ll need to spend time on the sites - so, choose one or two sites and don’t stretch yourself thin. Fill in your user profile on the sites. Include a friendly photo of yourself, and enough information to show people they can trust you. You can generally link to your blog or website here. Find your niche category and engage authentically with your knowledge. Give quality information that genuinely answers the question. This is your opportunity to solve a potential customer’s problem. The better you answer, the more upvotes and other credits you’ll get, which will give you rewards such as being an industry leader on the sites. If appropriate, include a link to your blog article(s). Pay attention to the sites guidelines on linking. Engage with people on the site. Build relationships with your blog readership by upvoting answers and following others. Ask questions, as well as answering them. Answer questions that are not linked back to your site, too. Show that you’re genuinely interested (and interesting) to develop your credibility. Become an industry leader. The better you connect with your market, and provide your niche what they want, the more rewarded you will be. Most Q&A sites give out status rewards. The more points you have, the more clout your answers or profile will be given. Find the best Q&A sites for your business, such as Quora, Yahoo Answers, StackExchange, or askville. Engage with best practises to become a trusted industry leader, and drive more traffic to your site. Niche forums are similar to Q&A sites, but they often offer a more conversational approach. They can be a very cool way to connect with your niche consumer, build links to improve your SEO, and drive traffic directly to your blog. Find and develop new customers: Niche forums are an incredible method of finding your customer and developing relationships with them. These sites are like lowing hanging fruit for your particular market. Engage on them with knowledge and authenticity, and you’ll connect with people who are ripe to want your products. Link building and SEO: Just as on Q&A sites, forums offer link building and SEO opportunities. Use them as a way to get your blog more searchable. Don’t spam these sites just to get more links. Not only does this make you look bad as a business - many forums will kick you off. Read the site guidelines before you begin engaging. Listen to your market: Use niche forums to learn about your customer. Listen to what their needs are, and use this to be a better marketer. Get ideas for new blog posts, too. If there are popular discussions around a particular topic - write about this on your blog. Then post it on your forums and encourage comments on your own website. Drive traffic to your blog: Put a link to your blog in your forum signature and profile. If the site allows it, link to your blog in some of your discussions too. There are a number of methods to finding your industry niche forums. For the purpose of illustration, let’s say you’re in the travel business, and you have an amazing travel blog. The simplest way to find your niche forums is by searching on Google. Type in your niche keyword(s) with “forum”. When you’re using Google to find the sites, generally the most high traffic sites will come up first (Google’s latest Hummingbird algorithm may change results slightly - but I’m digressing). You’ll find forums like: The Lonely Planet, Fodors, and Trip Advisor. Check out the sites, as outlined below, and engage. Listen to where your best customers go (you can ask them too), and research sites that best fit with your specific business needs. Follow niche hashtags. 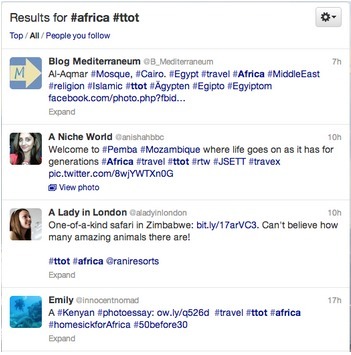 Once you’ve searched and found good hashtags, follow them, and get to know what sites potential customers are using. Check out common links. A lot of potential customers use Twitter to spread the word about the forums they’re on. Check out a few for your niche. Find that perfect sweet spot. Make a list of 5-10 cool niche forums. Analyze the sites for: Alexa ranking, membership numbers, activity,(if no one’s posted in 2 months - it’s not worth your time), quality of engagement, structure of the forum, forum guidelines and best practices, etc. Once you’ve found a few perfectly fitting forums, it’s time to engage with your fresh watering hole. Sign up to post on your targeted forums. Read the site guidelines. Make sure you know how to use the site, and you engage with best practices for each forum. Fill in your profile, with a link to your blog. Include a friendly image of yourself too (don’t use your business logo - make it personal). Many sites also give you a signature. Make sure you link back to your blog on it. Find popular strings on your niche topics. Engage on topics that you can show expertise in. Engage in strings that get a lot of views. This one day old post on the Lonely Planet’s Thorn Tree Forum has had 9 replies and 189 views. Discuss with quality information that adds value to the conversation. The more helpful and knowledgeable you are, the more people will engage with you on the site, and will then click through to your blog. Include links. If the site lets you include links in your posts, do it. If not, include links in your profile, and signature, as mentioned. Use niche forums to engage with your target market, and drive traffic back to your blog. Find your particular niche forums through Google, and from your social networks. Engage in best practises by posting intelligently and not spamming! Use Q&A sites and niche forums to truly engage with your market. You’ll find your peeps, and - if you engage well - they’ll be happy you did. What do you think? Do you use Q&A sites and niche forums to get more blog traffic? What results have you seen? What tips can you share?